Fried chicken taquitos loaded with succulent chicken and cream cheese? Yes, please! I can’t get enough of these! Okay, folks, brace yourselves because I have so many Mexican recipes coming up! I’ll try to get a few Mother’s Day ones too, but my heart right now is 100% Mexicano! I guess y’all already know I’m super excited for Cinco de Mayo! But today’s post is actually in honor of Dia del Niño, which is celebrated on April 30. And then I moved to the States and now not only I don’t get Children’s Day gifts anymore, but I barely get anything for my birthday (except from my lovely husband, of course!). So I got into the habit of gifting MYSELF! So to celebrate Dia del Niño, I made what I think is the most child (and Olivia) friendly Mexican food: chicken taquitos, or chicken flautas like they call in Mexico. 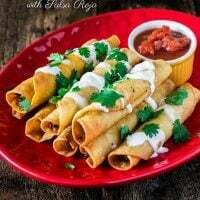 Not only the chicken taquitos are so delicious that they will have your kids licking their fingers, they are also a fun activity to do as a family. The recipe also gets way easier if you have little helpers to aid you roll the taquitos. Oh, who am I kidding? I’m not gonna lie, I’m am too much of a perfectionist to let kids – or my husband, for that matter – roll my taquitos. They can eat it later! ? 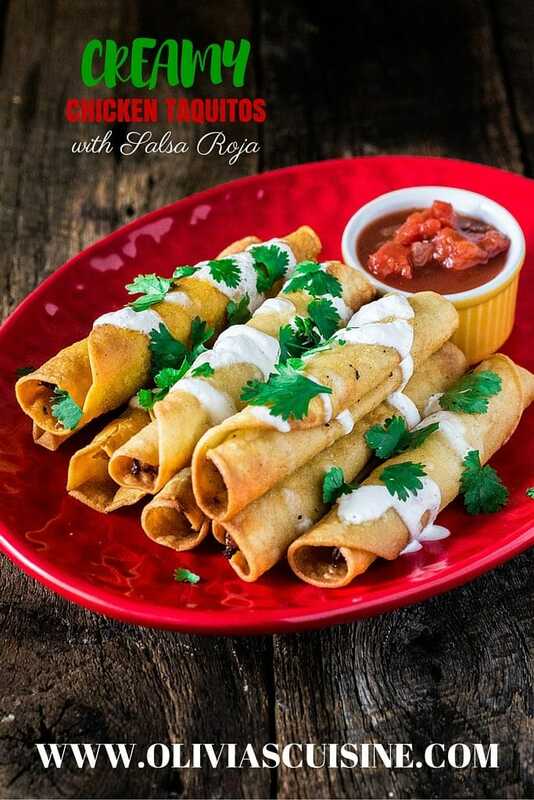 Although rolling the taquitos can be a little time consuming, this recipe is not hard at all! Not to mention, these chicken taquitos are the perfect excuse to use that leftover chicken that has been sitting on your fridge. Or, if you don’t happen to have any leftover chicken, a quick trip to the grocery store to buy a rotisserie chicken and you’re all set! But the difference between these chicken taquitos and plain old boring chicken taquitos? A whole jar of salsa! It really doesn’t get any easier than opening a jar, folks! True, I added sautéed onions and garlic to the recipe, because a basic soffrito is always a must for me. As for the cream cheese, although I’m saying it is optional in the instructions below, the truth is that they take this taquito up to a whole new level. Like to a creamy heaven kinda level! So yeah, I guess the cream cheese is not really optional if you’re looking to making the BEST chicken taquitos ever! And why wouldn’t you, right? Life is short and it’s all about the good food we eat! Okay, maybe it’s about some other important things too, like family and friends! I hope you guys enjoy the taquitos. If my obsession with them is any indication, I think you are going to LOVE IT! Oh, and you guys? These are FREEZER FRIENDLY! Meaning, crunchy delicious taquitos any time you want! In a large sauté pan, over medium heat, heat the olive oil and sauté the onions and garlic until translucent, about 2 minutes. Add the shredded chicken, salsa, dried oregano and chili powder and mix to combine. Stir in the cream cheese, if using, and combine well. Reserve. Heat the vegetable oil - enough for a shallow fry - in a separate frying pan. Working with 2 at a time, flash fry tortillas for 2-3 seconds per side until just soft; remove from oil and place on a paper towel covered plate. Place 2 tablespoons of the filling in a vertical line down the center of each softened tortilla, and roll up tightly. With the seam side down, fry the taquitos in batches of six for 2-3 minutes per side, until deep golden and crispy. The frying process should shut them close, but if you are having difficulty, just use toothpicks to secure the taquitos. Place finished taquitos on a paper towel-lined tray and keep them hot until ready to serve. Serve with some more salsa and/or sour cream. If freezing, just let it cool down completely after frying and transfer to a large airtight container (or individual servings in small containers). When ready to eat, reheat by pan-frying or baking at 400F degrees. I made this as part of dinner last night with cream cheese combined with cheddar – so good! I can see myself making this recipe several times over in the near future :) Thank you for sharing. Girlfriend, keep bringing on the Mexican recipes! I personally can NOT get enough of all things Mexican and delicious, so I can’t wait to see what else you share! 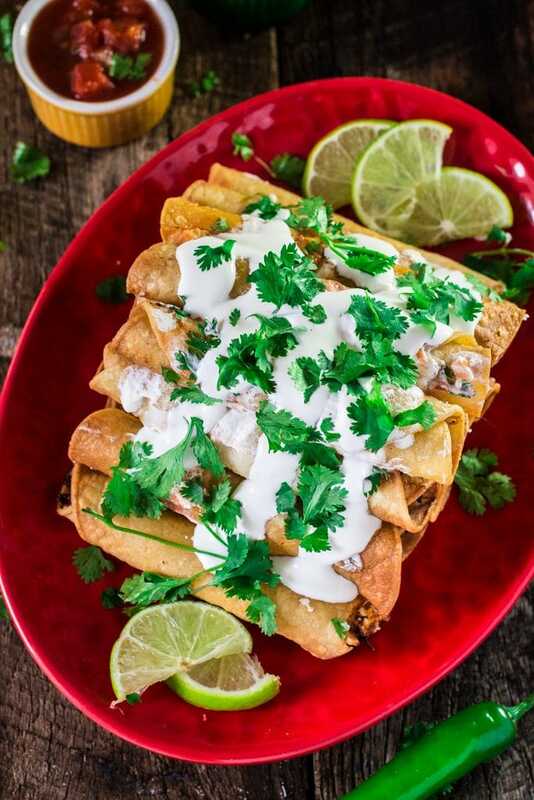 Taquitos are dangerously delicious and these look perfect! Creamy chicken and salsa roja!? Sign me up!! Cheers, girlfriend! Mexican recipes are so delicious! Thank you for this wonderful one!